Today we had an opportunity to look at another motherboard in the MSI lineup. 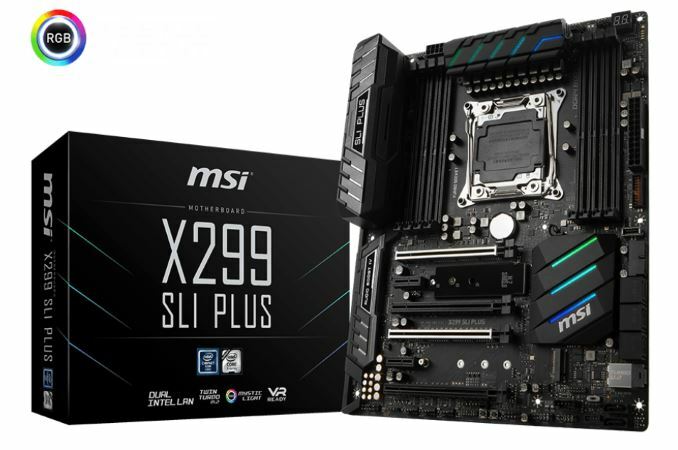 Instead of coming from the Enthusiast, Performance, or Arsenal line of products, the MSI X299 SLI Plus hails from their Professional line of motherboards. The SLI Plus is often cited as a low-cost, 'meets almost everyone's needs' type of board, and previous iterations have worked well in the past. We put it on the test bed for a thorough inspection. The SLI Plus range of MSI motherboards is a brand that aims for a low-cost price point, but uses the overclocking chipset to aim for the entry level of performance-per-dollar while still retaining all the key chipset features as well as a number of aesthetics. These boards are geared up for almost anyone: gamers, users, professionals, all of whom do not want extra 'fluff' and can provide their own controllers. These boards still use good quality components, and they are not completely stripped down, but it is usually clear that the SLI Plus often has a lower profit margin than some other boards. We reviewed the Z270 SLI Plus at the beginning of this year, when it beat out a similarly priced competitor, and the Z170 SLI Plus in Q2 2016, where it achieved one of our rare 'AnandTech Recommended' awards. The X299 SLI Plus has a legacy to live up to. Overall, the CPU performance on the X299 SLI Plus was above average, managing to beat out comparable boards in some tests due to the use of Multi-Core Enhancement. Some tests were more affected by MCE than others which was a little strange, especially as other MSI boards with MCE performed better in some tests as well. We are not entirely sure why this happened as the testing used the exact same settings and drivers. Even turbo/clock speeds were the same in both tests, so it might be related to how the board ramps up and down the frequency on the local environment at the time. On non-CPU performance, startup times were in the middle of the pack, while power use was slightly higher than the previous X299 boards tested. Overclocking results were the same as our other high-end motherboard tests, with our i9-7900X hitting 4.5 GHz at our temperature limit. The voltage needed to reach the clocks was slightly less, though not enough to push past our current temperature limited clock speeds. The small variance could also be due to software since the board does not have voltage read points to confirm with a digital multi-meter. For features, the storage connectivity of the MSI X299 SLI Plus has eight SATA ports from the chipset, as well as two M.2 slots and a U.2 port, which are also funneled through the chipset. Lane sharing and port availability will need to be considered when attaching some of these peripherals, which is an issue that should have been solved with the new chipsets. The SLI Plus brings two USB 3.1 (10 Gbps) ports on the rear panel, in Type-A and Type-C connectivity, and a front panel 10 Gbps port, all of which are handled by two ASMedia 3142 controllers. Five USB 3.1 (5 Gbps ports) and eight USB 2.0 ports also go through the chipset, while an additional three USB 3.1 (5 Gbps) ports are from an ASMedia ASM1074 hub. Networking comes from dual Intel I219-V Gigabit ports. For a Pro Series or workstation type board, there are enough options for almost any use. On the professional side of things, the addition of the U.2 slot gives users some additional flexibility (it would be more relevant if more vendors would release more drives). If multi-GPU gaming is a consideration, the SLI Plus covers that option supporting both NVIDIA 2-Way SLI and 3-Way AMD Crossfire configurations. Other functionality, such as 10 GbE, can be added via a card if needed (especially if our readers picked up one of the Aquantia 5/10 GbE cards on offer recently). Regarding overclocking, the board reached the CPUs 4.5 GHz limit with our cooling without signs of throttling and performed admirably in our tests, but used a little more power than other boards in doing so. The MSI X299 SLI Plus is the flagship offering in MSI's 'Pro Series' X299 motherboard lineup. With it are two other boards, the X299 Raider and the MicroATX X299M-A Pro. The Raider offers a couple fewer features, for example, no integrated RGB LEDs, one less x1 PCIe slot, and will also cost less. The MicroATX board drops a full-length PCIe slot (down to 3), does not have an x1 sized PCIe slot, but does have RGB LEDs on the shroud. "Pro Series" nomenclature aside, the X299 SLI Plus is a feature rich board for a base X299 implementation. Features such as reinforced PCIe slots, a debug LED, a front panel USB 3.1 (10 Gbps) header, eight SATA ports versus six, a dual BIOS, dual NICs, as well as the top Realtek ALC1220 codec, all find their way to the SLI Plus. The U.2 slot, not found on many boards in the MSI lineup, gives users more flexibility with storage options than the standard SATA and M.2. The X299 SLI Plus is currently priced at $231.89 (from $259.99) at Amazon.com. This price point puts it in the ballpark of some Arsenal boards like the Tomahawk ($270) and Tomahawk Arctic ($280) which we also recently reviewed. The X299 Raider is priced at ($220). Outside of MSI, price wise, the SLI Plus competes with boards such as the ASUS TUF X299 Mark 2 ($260 w/Free Assasin's Creed Game), the Gigabyte X299 AORUS Gaming 3 ($250), as well as the ASRock X299 Gaming K6 ($250). MSI brings a current total of 11 X299 boards to choose from: the MSI X299 XPower Gaming AC holds the flagship title and makes its home in the Enthusiast Gaming segment along with the X299 Gaming M7 ACK. There are a total of three boards in the Performance Gaming hierarchy in the X299 Gaming Pro Carbon AC, Gaming Pro Carbon, and X299M Gaming Pro Carbon AC (mATX). The Arsenal line carries the three Tomahawk boards, the X299 Tomahawk, the X299 Tomahawk Arctic and the X299 Tomahawk AC, while the Pro lineup for professionals has three motherboards; X299 SLI Plus, X299 Raider, and X299M-A Pro. *The X299M Gaming Pro Carbon (and the X299M-A Pro), according to our MSI USA contacts, is coming in December. It currently has not hit the US market for some unknown reasons, but we were able to confirm it is coming, and rather soon. 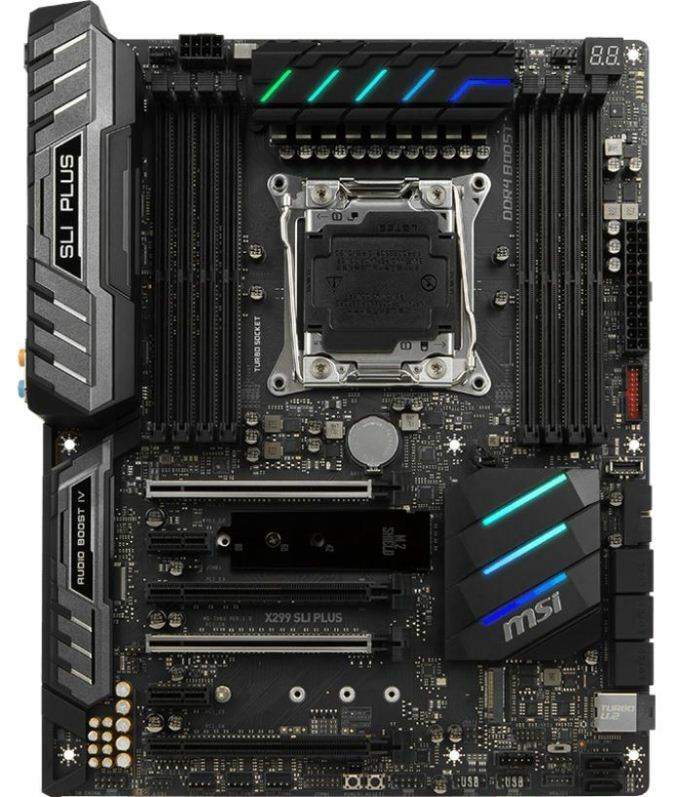 Board partners have launched dozens of motherboards on this platform already, several of which we will have an opportunity to look over in the coming weeks and months. This specific review will cover the MSI X299 SLI Plus. Why, why manufacturers won't let the U.2 die? We are already past SATA Express, and now this. I get it, it's one of the most popular connectors to connect SAS backplanes, and most of HBAs and RAID controllers do use it, but please, let it die in desktop space. If anything SFF8087 should remain, as SFF-8639 (U.2) is much flimsier and easier to break.